My husband has worked five years with an amazing company, and they honor all the employees that have been there for each year by fives, so we were invited to attend a dinner in his honor (among others)! The invitation said to wear "dressy western" attire. I have nothing that is western! My cousins in Colorado had the western wear, but I never had anything remotely western. Guess that's what happens when you grow up in San Diego! So, I started searching Pinterest for "Dressy Western Outfits" and only a handful of ideas came up that I could work with. I realized that first, for both my husband and I, we would want to get some cowboy boots. I looked on Ebay and Amazon and found a good deal on Amazon for both pairs. For myself, I got Laredo Women's Paprika Western Boot. I don't know what price you'll find when you check them out, but I got a great deal in my size! 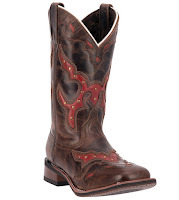 For my husband we found Laredo Men's London Western Boot. 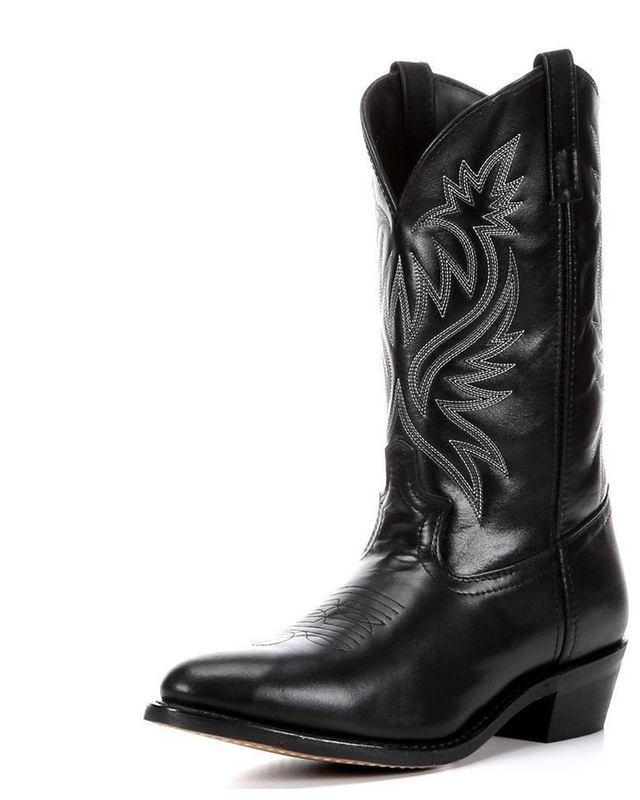 We also got a good deal on his boot, and great service, as we realized that my husband's go-to size was too large in this boot. They let us return the pair and get the right size. We dropped by the local Boot Barn store, and in there I found a crochet vest that I thought was cool. But being a crocheter, I thought, "I could make something like that!" I searched for about a week for a pattern, but I realized I was going to have to make it up. But I found the same "yarn" as the vest at Michael's, which was perfect! It's called Bernat Maker Home Dec and I got it in Cream. 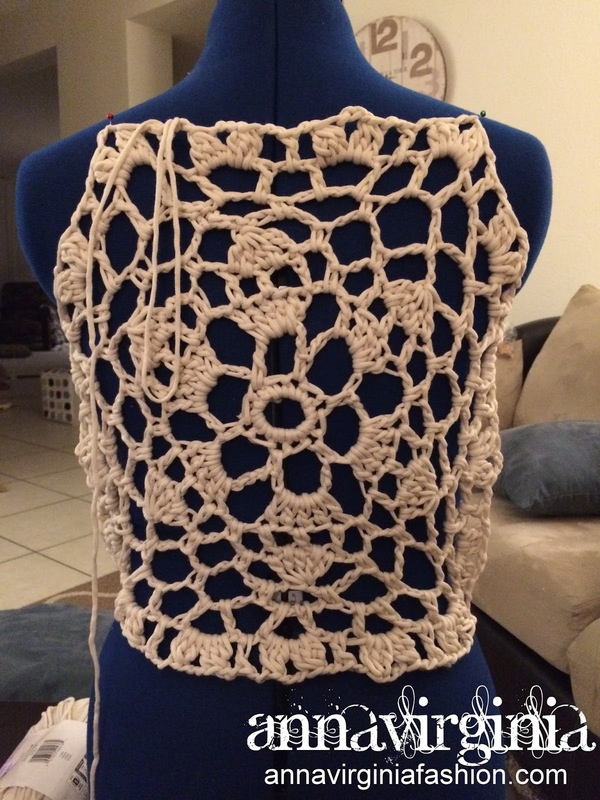 I started with a circular motif for the back, and a large size N crochet hook. 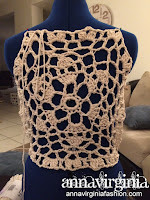 I used my dressform to make sure it was wearable, and began to crochet the straps over the shoulders. Once the front measured the same as the length of the motif, I attached them together and then crocheted the "skirt" part of the vest. I then added a fringe. The vest project was frustrating, because I knew exactly what I wanted to make, but had a hard time finding any pictures, let alone patterns. But it was also fun because it came together in the end. I'm hoping to create a pattern for it in the future, so others don't have to find the same frustration, hopefully! 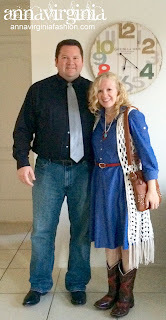 In case you're curious, the dress I'm wearing under the vest is Anne Klein. I found it at the second hand store more than a year ago, and I thought chambray (or denim) would be great with the boots. So there's a crafty, non-western mom's approach to "dressy western" for a fancy dinner. Hah! P.S. I'm realizing that in every home I move into, I have to find that photography sweet spot for my photos. It's a learning process for me and I still haven't quite got the right spot in this new home!